The decoupling kit allows vibration-free mounting of the pump of a water cooling system in a PC enclosure. With this kit no vibration can be passed on or even be amplified by the enclosure and the pump works almost inaudibly. 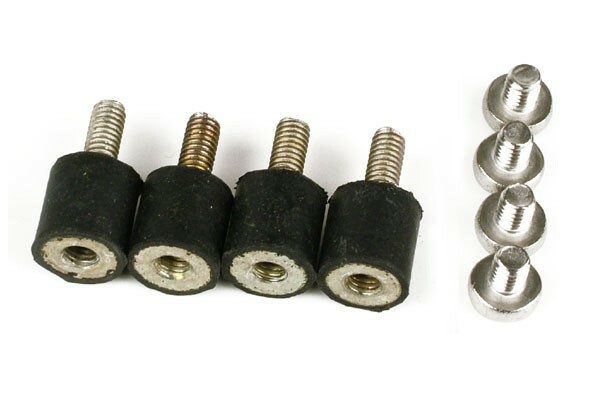 Of course all other components can also be installed vibration-free with this kit. This kit is specially designed for use with the DDC top! Entkoppeln die Schrauben genauso stark wie ein Shoggy Sandwich? Im konkreten Fall geht es um die Eispumpe vpp755 und dem Eisbecher D5. Das Schoggy Sandwich ist weicher und entkoppelt daher etwas besser. Dieses Set ist aber insgesamt stabiler da es den Eisbecher direkt verschraubt.